The day is finally here. As promised, I’ll release the benchmarks and a more detailed review of the Asus ROG Crosshair IV Extreme motherboard that has been making quite a scene in the tech world these few days. Allow me to officially introduce to you the best AMD 890FX chipset motherboard on the market, Asus Crosshair IV Extreme. ASUS, the world’s top 3 consumer notebook vendor and the maker of the world’s best selling and most award winning motherboards, is a leading enterprise in the new digital era. ASUS designs and manufactures products that perfectly meet the needs of today’s digital home, office and person, with a broad portfolio that includes motherboards, graphics cards, displays, desktop PCs, notebooks, netbooks, servers, multimedia, wireless solutions, networking devices and mobile phones. Driven by innovation and committed to quality, ASUS won 3,268 awards in 2009, and is widely credited with revolutionizing the PC industry with the Eee PC™. With a global staff of more than ten thousand people and a world-class R&D team of 3,000 engineers, the company’s revenue for 2009 was US$7.5 billion. Before moving onto the main course, let’s have some appetizer first. The Crosshair IV Extreme motherboard definitely comes with quite a number of accessories! This includes a one of a kind bluetooth module that will allow RC bluetooth function to be enabled. Fear not as Asus did not skimp on the accessories, everything that you will need for your new gaming desktop build will be in this box. Featuring AMD’s 890FX and SB850 chipset, you’re definitely getting the best performing system out of AMD’s lineup of chipsets because the partnership of 890FX and SB850 is the best up to date. Firstly, support for AM3 processors means that any processors that are socket AM2+ or AM3 will run on this motherboard. For example, an AMD Phenom II x6 1090T or 1055T paired with this motherboard promises extraordinary performance and overclocking capabilities like never before. SATA 6Gbps natively found on the SB850 also brings down the latency between the southbridge chipset and processor, unlike 3rd party SATA 6Gbps chips that will also reduce the number of PCI-E electrical lanes bandwidth available for your graphics or other peripherals. With the Crosshair IV naked, we can completely see the Lucid Hydra chip that is doing all the work bringing about multi GPU cross platform scaling. 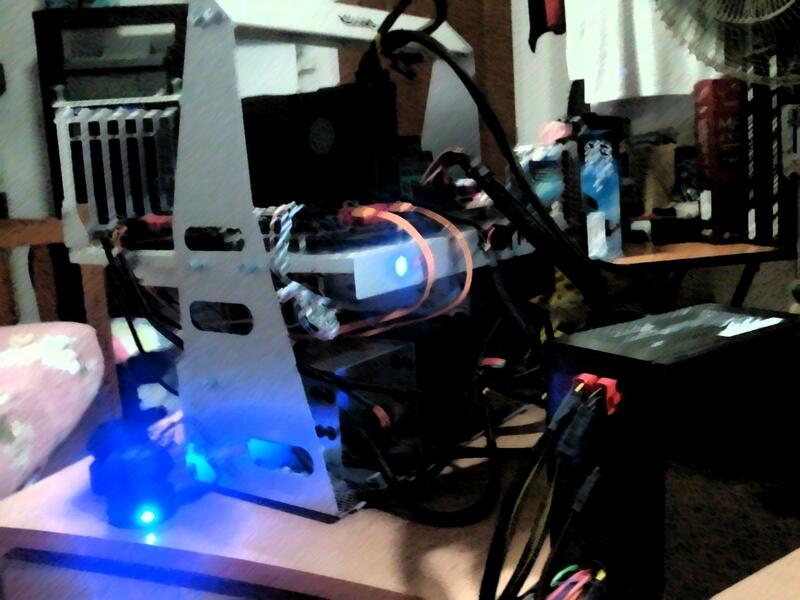 You never knew a GTX480 could work hand in hand with a 5870 right? Above the Lucid chip (in this picture) is SB850. The chipsets will get themselves accessorized by some juiced up heatsink which even includes a fan. More details follows. 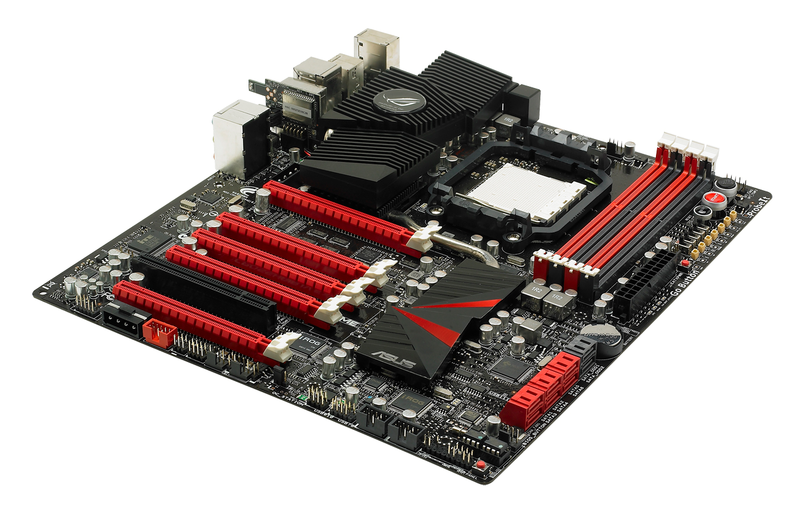 There is no doubt why a Red and Black theme was chosen for this motherboard. This board certainly makes all AMD fan boys go “Oh My God”. I admit that holding the Crosshair IV Extreme in my hands and being in awe of its aesthetics appeal is just like looking at the beautiful girl that you have always had a thing for-your heart goes badadoom badaboom. Maybe I exaggerate a little, but honestly that was how I felt. Well, you must admit red and black goes well together don’t you? Black PCB makes all the components on the board stand out with contrasting red. I’ve already forgotten that this is actually a motherboard! Over at the northbridge/VRM/Mosfets area, a “dome” shaped heatsink was placed there, connecting all the way to the southbridge chip area. Ever wonder why the southbridge chipset heatsink seemed bigger than normal? You’ve guessed it right. As I have said, it cools the Lucid Hydra Chip as well. 2 shiny red streaks of plating found on the southbridge/lucid cooler embellishes the whole motherboard as a whole. ROG Logo that lights up RED! Last of all, the Republic of Gamers logo actually lights up when you switch on the computer! More importantly, it lights up RED! -Red and black goes well together, yet they are so contrasting. A one of a kind design by Asus, there is actually a fan built into the overall heatsinks of the NB/Mosfets area that blows off the extra heat pushing your overclocks to the limits. A heatpipe then connects from the NB area all the way to the SB/Lucid chip area, dissipating heat efficiently especially with that extra fan onboard. Fins found on the NB/Mosfets heatsinks also physically improve heat dissipation by increasing surface area. When extreme overclocking is taking place, you need the most accurate readings of the voltages of the different components of the motherboard in order to bring out the best of it. Performance tuning software can provide you with the voltage readings but they have their limitations as well-they are not as accurate and you need to be within Windows(OS) to perform the checking. What happens when you need to measure your voltages before your computer is fully loaded up, or what can you do to get the most accurate readings? Being the most high end AMD motherboard in the market, Crosshair IV Extreme motherboard includes physical voltage reading points so that you can actually get the most accurate voltage readings off your motherboard via a voltmeter on a real time basis! Voltages of your HyperTransport link, Southbridge, Northbridge, RAM, VCORE and etc can be recorded by just putting the negative end of the voltmeter to GND and positive end to the reading point accordingly to the respective reading point. 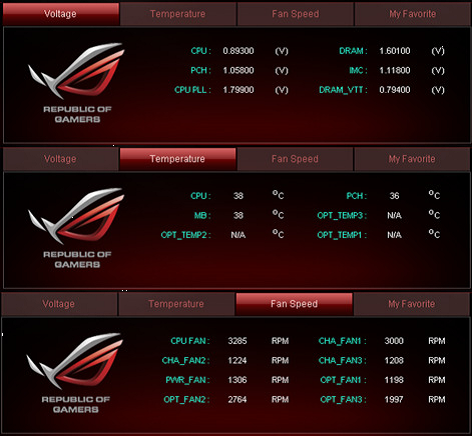 Asus named their technology ProbeIt. 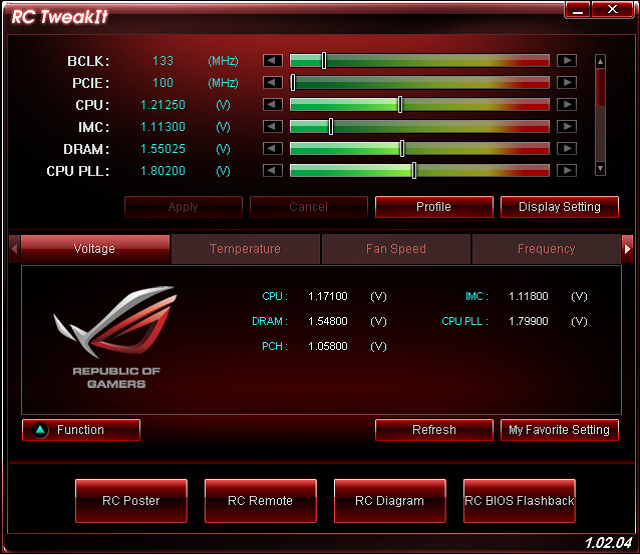 It’s quite common to see onboard switches on newer motherboards, however, the reset,start and core unlocker button on the Asus Crosshair IV Extreme not only make switching on or resetting the computer much easier, but it also beautifies the whole motherboard and computer system as a whole. 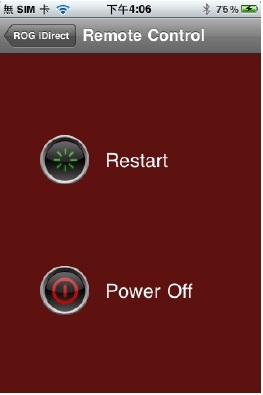 When will you ever see buttons that light up red when there is electricity current exciting the motherboard? Only possible with the one and only Crosshair IV Extreme motherboard. Buttons that lid up when the system is powered on. AMD processors are known to all about their unlocking features and superb price to performance ratio. What do I mean by unlocking? Some AMD processors can actually be unlocked from a dual or tri core to a quad core, but only depending on the processor, that is if you’re lucky. However, after upgrading to a SB850 chipset, Advance Clock Calibration feature which is the feature doing all the magic for unlocking processor cores is actually left out. Luckily, third party solutions are available, just like what Asus has done to Crosshair IV Extreme. 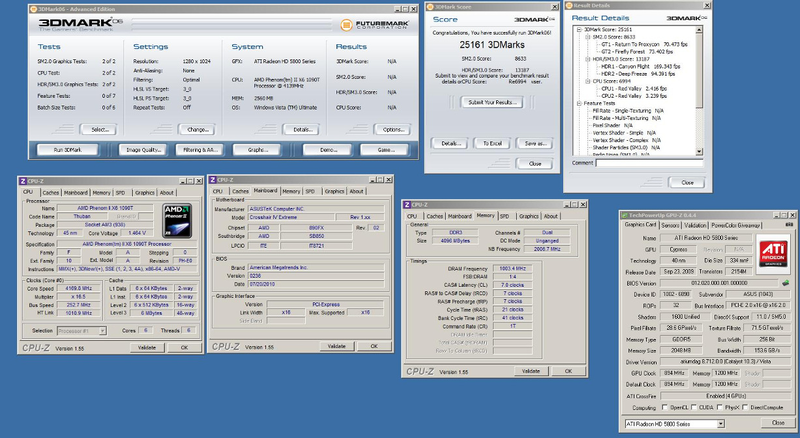 Unlocking stable cores on Crosshair IV Extreme is just as easy as pushing the button on the motherboard, and Wada!- you turn a inexpensive Phenom II x2 into a much more expensive Phenom II x4. Talking about great cost to performance ratio! Ever had problems removing your RAMs from your RAM slots just because your huge graphics card is blocking the locks of your RAM slots? Asus has put much thought into this and came out with Q-Dimm innovation. Interestingly, you can feel safe to only lock your RAMs with one latch at the top of the motherboard which is not blocked by anything at all and the DIMM actually locks in place. When removing RAMs, just pull the whole RAM out! Say goodbye to hassle as you need not remove your XL graphics card anymore! In order to reduce the difficulty of removing large VGA cards from PCI Express slots, while still being able to secure the card in place when been installed, Asus has developed the Universal PCI express slot with auto-lock and easy unlock capability. With the presence of Q-Slot, removing multiple large graphic cards no longer cause headaches no matter how big the cards are. In order to provide a cleaner and more stable power throughout all your graphics card and pushing all the graphics card to their limits, the two EZPlugs which is 2 4-Pin Molex will deliver the extra 12V power source to them. Pretty useful when carrying out extreme overclocking like a LN2 session. Unlike conventional motherboard which only comes with Realtek ethernet chip, Crosshair IV Extreme give gamers the extra edge over their opponents with better response rate. Spot your opponents faster than the others with the Intel Ethernet chip. You’re ready to frag in online games that requires fast response from the user such as First Person Shooter games. You’re be surprised by the extra advantage you get shown in multiple winning streaks in LAN parties. With 5 PCI-E x16 switches found on the right hand side of Crosshair IV Extreme, you’ll get much more convenience when troubleshooting your computer. In multiple GPU configurations, a single Graphics card may be stopping you from booting your system. The switches come in handy this way, you can easily find out with is the naughty one causing all the problems. Benchmarking your system is made much easier as well with the switches. Push it to off and you instantly remove a graphics card from your multiple GPU configuration. Getting your 3DMark Vantage scores can be done in matter of minutes. An additional J-Micron 363 chip added on the motherboard provides an additional 2 SATA ports to the motherboard, making 8 SATA ports available in total. It is recommended that you use the black SATA ports for your optical drives as they are of SATA2 interface with a bandwidth of 3Gbps, unlike the 6 red ones of native SB850 chipset which gives a bandwidth of 6Gbps. Leave the red ones for your hard drives. While USB ports are found everywhere nowadays and in almost ALL external hard drive, the interface which is limited at 480Mbps is actually bottlenecking the transfer rate of data of the hard drive. New USB3.0 makes sure that more current will run through your devices to really provide the juice for it to power up as well as making sure that data transfer is as fast as possible. Improving speeds up to 10 times, USB 3.0 interface delivers your 10GB bluray videos in just less than 17 seconds with a bandwidth of 5Gbps. That’s amazingly fast. 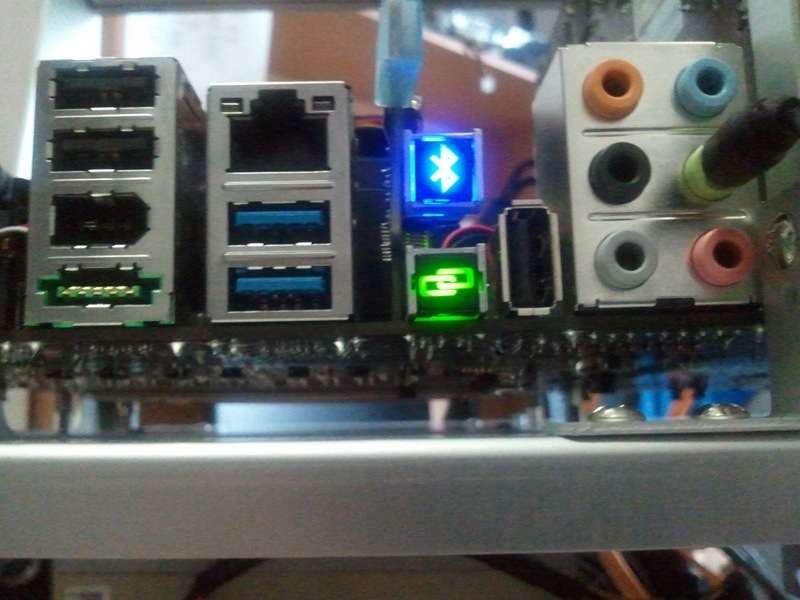 Originally, E-Sata interfaces do not bring electric current over the esata cable, and in order to power up esata devices, you need to connect an additional USB cable to your peripheral. In this case, there will be more cables and you may experience some problems especially when you do not have sufficient number of USB ports. PowerSATA solves the problem by allowing current to run through the Esata cable, so an additional USB cable is not needed at all to power up your Esata device. Remember, plug your esata device into the port below the firewire port. Met with a failed overclock? Fail not because with a Clear CMOS button conveniently located not at your house void deck but at the back of your motherboard, clearing your CMOS is just as easy as pushing a button. If you have any handheld devices or smart phones, monitoring your system in realtime is made possible. 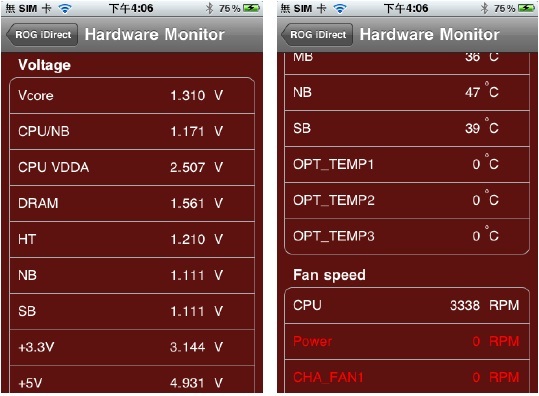 It will be uber cool if you were to change your FSB and voltages on an iPad for an instance. iDirect makes it possible on various platforms, such as Android, Windows Mobile, Symbian and of course iPhone OS3.0(Mac OSX). 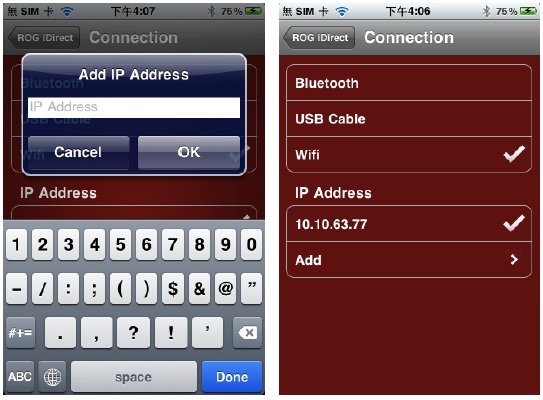 Connect by Bluetooth, USB or Wifi! Ever got screwed up when your BIOS fail and your need to reflash your BIOS but can’t even power on your computer? Fear not as USB BIOS Flashback will finally provide the utmost suitable answer to your problems. With USB BIOS Flashback, all you need to do is just plug your USB key into the ROG USB port with the BIOS already inside(downloaded from another computer), go through the following steps and done! 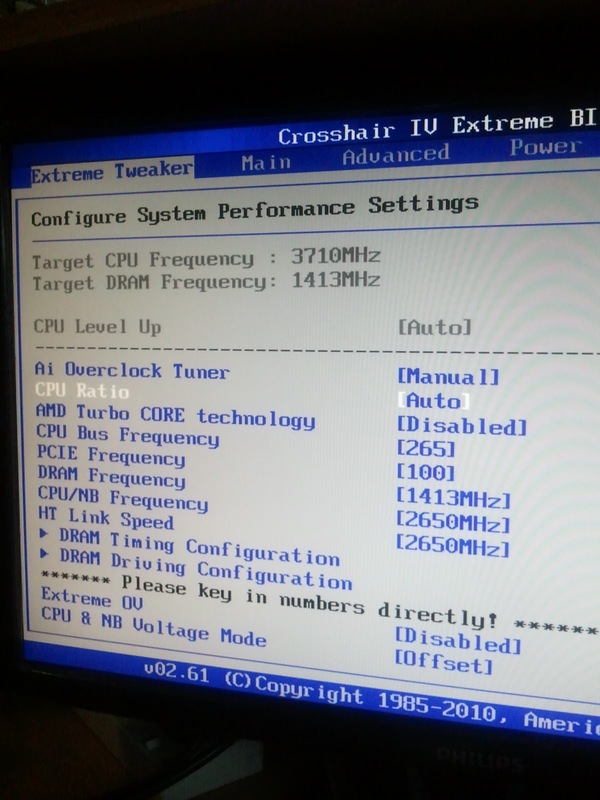 The Crosshair IV Extreme mother is just meant to be overclocked. In fact, once you get into the BIOS menu, you’re greeted with settings to change your voltage and frequencies instead of the conventional time and date and etc settings. I was able to push my 1055T to a 4.0GHz with no problems at all and running stable. Do note that I was still on a stock AMD heatsink fan, so I couldn’t bring myself to torture it to even a higher overclocked state. 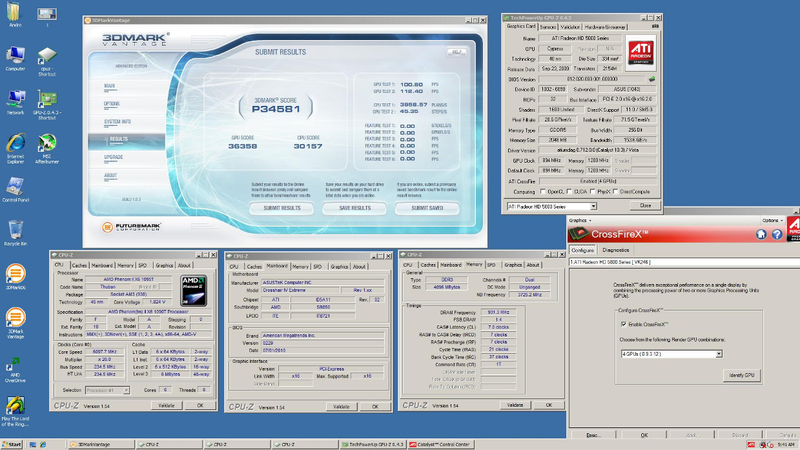 However, I’ve found better overclocking results as well, results done by the other enthusiasts. 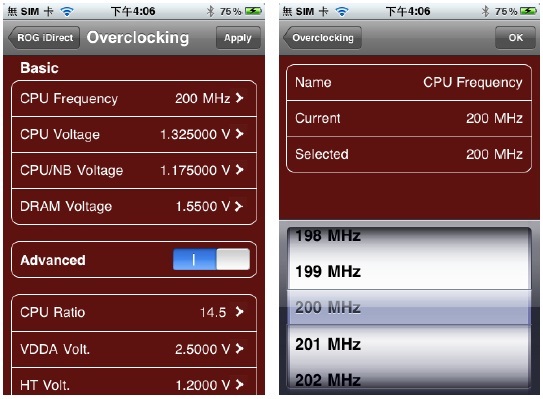 Turbo V software helps you to tweak your system within the operating system. You’re ready for some new world record after these tweaks. 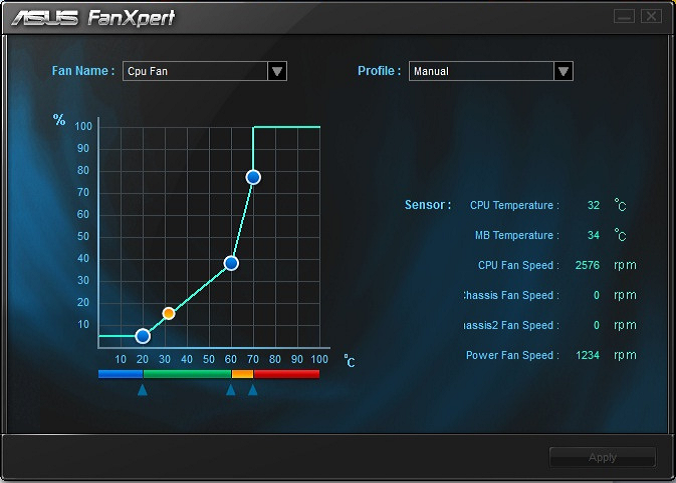 It also includes fanXpert software which allows a customised fan curve, giving you a good balance between fan noise and cooling performance. 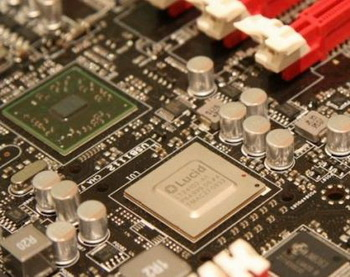 Just above the SB850 southbridge chip, the Lucid Hydra Chip is the chip that is doing all the magic within this motherboard. Alongside with native Quad-Crossfire Support made possible by AMD 890fx chipset, the Hydra chip allows you to mix and match both your ATI/AMD’s Graphics Cards together with Nvidia’s. In simpler terms, multi-GPU scaling is not limited by the GPU’s manufacturer. 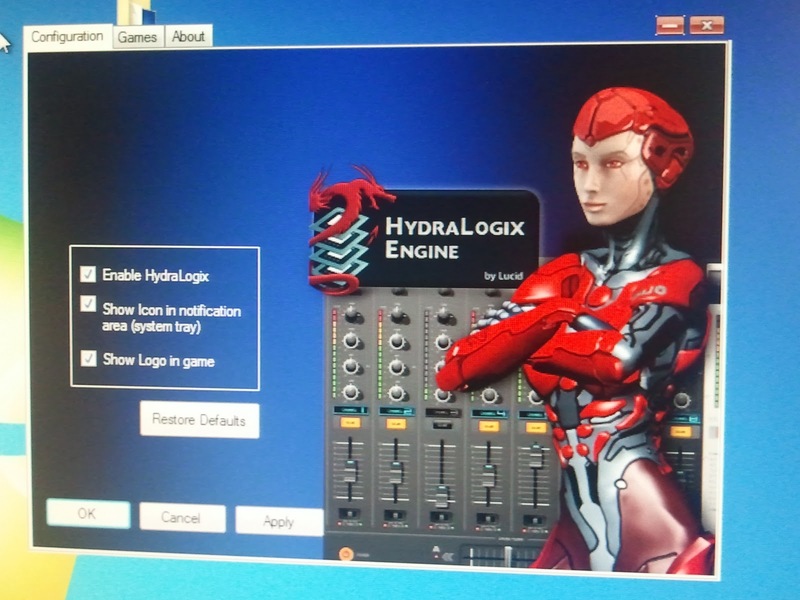 Although currently, you can mix and match up to a number of 3 graphics card, but in the future(Q4 2010 in fact), when new drivers for HYDRALOGIX are released, there will be support for even up to 4 or more graphics card, fully utilizing all the PCI-E 2.0 slots on the Crosshair IV Extreme. The fact that all PCI-E bandwidth are native to the 890fx chipset, unintended latency is also reduced to the lowest, proving Crosshair IV Extreme motherboard to be one of the birth of ingenious engineering done by the innovation team of Asus. AMD Turbo Core technology disabled. 3DMark Vantage is a PC benchmark suite designed to test the DirectX10 performance of your graphics card. A 3DMark score is an overall measure of your system’s 3D gaming capabilities, based on comprehensive real-time 3D graphics and processor tests. 3DMark is widely used by the PC industry, press and media as well as individual users and gamers, for comparing performance levels between whole systems or even specific components. 3DMark Vantage benchmarks definitely shows how well the lucid hydra chip and crosslinx 3 technology is at work and indeed producing very promising results. N Mode x3 which comprises of a GTX470,GTX465 and GTX460 exhibited a high score of 25107 and X Mode x3 gave us a score of22757. What does this means? CrossLinx3 technology definitely increases performance with an increased number of graphics card attached to the system. However, when speaking of efficiency comparing X-Mode and N- Mode, X-Mode actually scales better than the other, with a supposed increase of 60% efficiency of both the graphics core compared to 40% on N-mode. In this test, A Mode was actually performing a little bit better than Native crossfire X setup, and that was actually an eye opener for me, yet I wasn’t about to give up on Crossfire X technology at all, because one test doesn’t mean anything. Street Fighter IV is the epic remake of the clasic street fighter series. The most noticeable change is the visual facelift, the graphics are very different from its predecessors. The characters look like they are painted on screen but that does not mean that they look fake, in fact they look amazingly lifelike. The different effects are also much better looking. The game is a simple 1V1 game, and the draw of the game is the different powers and techniques each player can use. From fireballs to teleportation, the moves are animated beautifully. Moving on to something different, Street Fighter IV uses Direct X 9 instead of 10 of 3DMark Vantage. This time, N-mode totally failed the test performing worse than each individual card is supposed to perform. Yes, I agree that future driver updates will correct this issue, but it was demoralizing to see those results. Results on X-Mode were quite impressive although performance increase was not really significant. 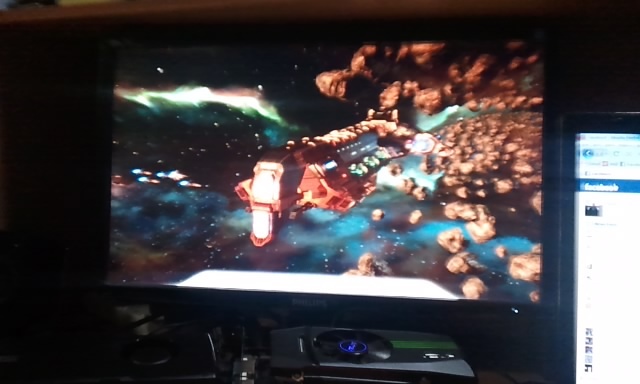 You know it’s better to be just on one graphics card when running on Direct X 9.0 games. 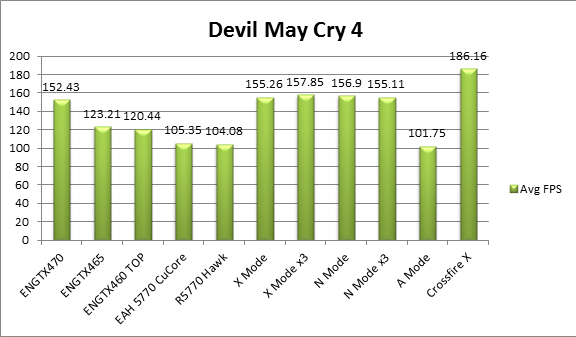 However, it was highly recommended to run a Native Crossfire X setup with dual 5770 as shown in this benchmark results. A Mode using the Lucid Hydra Chip was pwned by the native Crossfire X Setup as it managed to squeeze out almost 200 points more, reaching a performance of about a single GTX470. RE 5 is the 3D version of the classic survival horror game. You play in the over-the-shoulder view and have a weapon out that you can accurately aim with. The surroundings and enemies are very realistic and the game can be very fast-paced at times. There are a variety of weapons for you to choose from and this time you have another character controlled by AI that assists you throughout the game. Though the game is no longer as scary as the previous versions, the survival portion is still strongly focused on. A good storyline and realistic graphics make this a good game to try out. Resident Evil 5 is another test with Direct X 10 to confirm the suspicions with 3DMarkVantage. 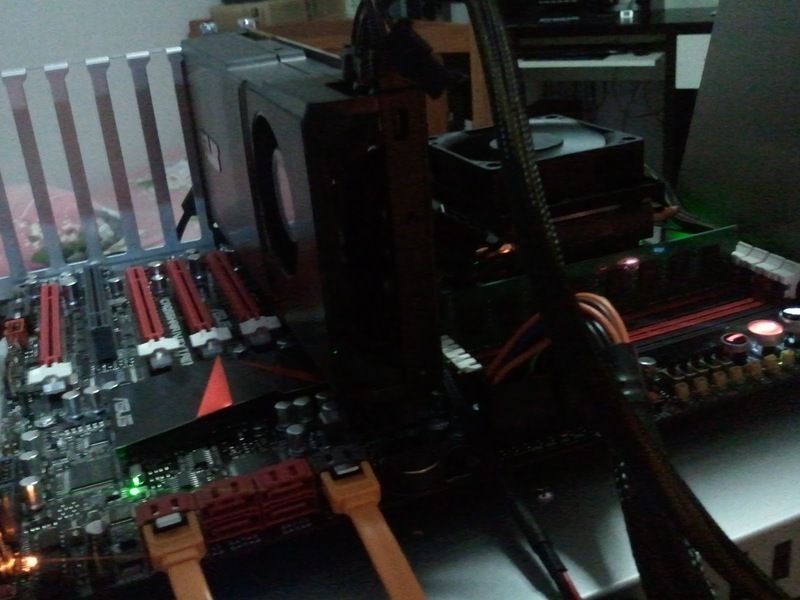 As expected, all multi GPU configurations gave good results, but there was a problem. Because of a performance gap between the GTX470 and a HD5770, there was actually a decrease in performance in X Mode x3. It is recommended that while in multiple GPU scaling using the Lucid Hydra Chip, there shouldn’t be much of a performance difference between the graphics card. It was confirmed when N Mode suffered the same problem as well with a decrease in average FPS in both x2 and x3 mode. This could also be accounted in the performance difference in the GTX470,GTX465 and GTX460. A Mode with 2 almost identical graphics card proved that performance gap was indeed the culprit when it actually scaled better and had an improved average FPS. In this test, Native Crossfire X technology certainly did not disappoint any AMD fans out there as improvement in FPS was almost 80%, surpassing all the benchmark results of the other configurations, and even doing better than a single GTX470. DMC4 is the latest in the series, with the red-cloaked half-demon Dante as the player. DMC is a hack-and-slash game, which means you go around eliminating all the enemies around you in order to progress forward. What makes this game good is the variety of weapons available, from dual pistols, a weaponized suitcase, piercing fangs and of course a huge sword. With this comes the option of switching about the weapons and creating a wide variety of combos. The graphics are top-notch and the landscapes are beautiful. I indeed had a hard time studying the benchmark results of Devil May Cry 4. It was another Direct X 10 benchmark, but the results were just too far off from expected. 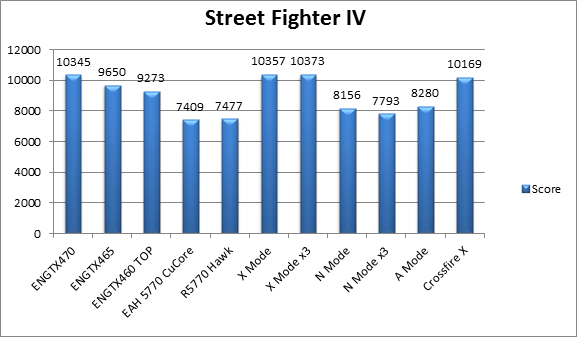 It was good to see that there was an minor improvement in terms of average FPS in X Mode, X Mode x3, N Mode and N Mode x3 but it seems that all these results seem to be similar, but yet Native Crossfire X setup was able to outdo them by so much. 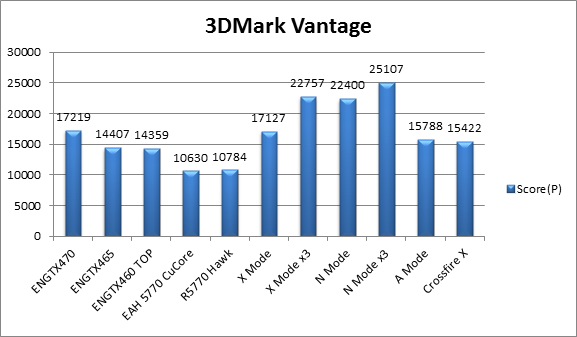 It was also strange that there wasn’t a X or N Mode logo at the top left hand corner when I was doing the benchmark. A Mode’s results were similar to a single 5770 as well. I have to conclude that this benchmark test was a complete failure, as the Lucid Hydra Chip was not put to test at all. All the results are merely results of a single GPU, with GTX470 in both X and N modes while a single 5770 in A mode. 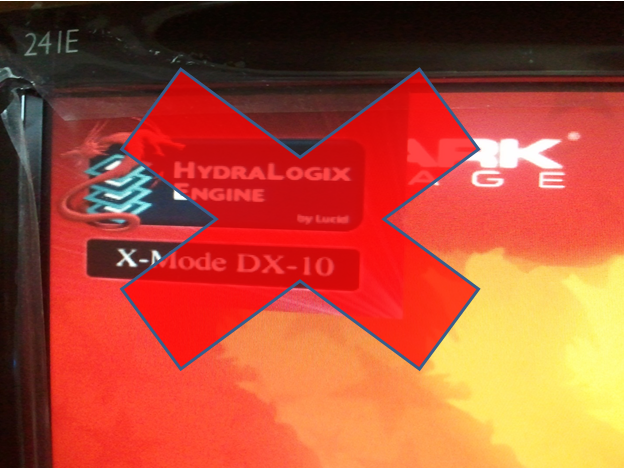 It seems that the Lucid Hydra control panel failed to initialize lucid hydra engine to render the games, and with any tweaking done to the control panel and to the games I have come to no avail in seeing any improvements in FPS. Looking on the bright side, Crossfire X setup scaled amazingly well again with an average score of 186.16 FPS, around 30 more frames than a single GTX470, definitely worth looking into it. 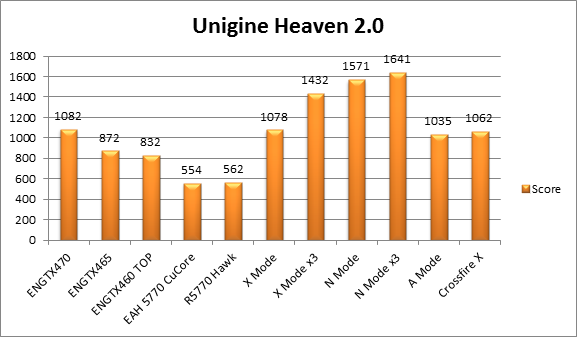 Heaven Benchmark is a DirectX 11 GPU benchmark based on advanced Unigine™ engine from Unigine Corp. It reveals the enchanting magic of floating islands with a tiny village hidden in the cloudy skies. Interactive mode provides emerging experience of exploring the intricate world of steampunk. Last but not least, we have our final and first Direct X 11 benchmark, the popular Unigine Heaven 2.0 benchmark. Excited by the performance that a Direct X 11 game or benchmark improvements that the Lucid Hydra chip can bring, I decided to give it another thought on the platform. N Mode x3 managed to give a score of 1641 points, the highest I’ve ever seen(I must be living in my own shell). Everything scaled well and in fact, I would call a Direct X 11 benchmark the best way to determine the effectiveness of the Lucid Hydra Chip. However the problem of performance difference of graphics cards still persists in this test, only shown in X Mode, while on the other hand, X Mode x3 showed a significant increase in score from 1078 to 1432. I was shocked to see that the scores went even higher with N Mode! As seen, performance difference between GTX 470 and GTX465 was not as big as then to HD5770, so the lucid hydra platform was able to flourish at this point. Undoubtedly I have changed my views towards this platform even though Direct X 10 and Direct X 9 tests results weren’t as impressive. 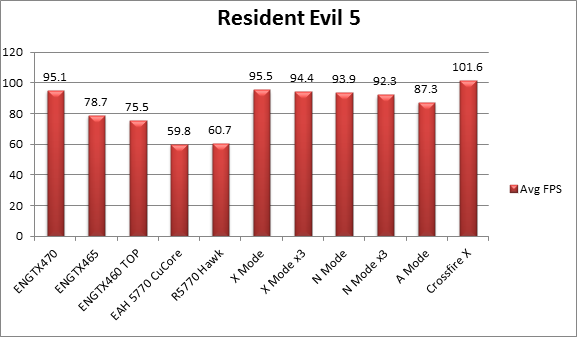 A Mode and Crossfire X both did pretty well as well, with A Mode slightly behind Crossfire X.
Amidst initial disappointments in the benchmark results of Direct X 10 and Direct X 9 scaling with the Lucid Hydra chip, Crosshair IV Extreme excelled in Native Crossfire X setups as well as Direct X 11 games. Since almost all games that are written and created will be out in Direct X 11, there isn’t a reason why you should be bogged down by the benchmark results of Dx 10 and 9. In fact, since Lucid Hydra is such a new technology and platform, the drivers will be updated so quickly that most of the problems that it faces today will all be gone in the future. Lucid will be releasing the drivers for 4 GPU configurations in the coming months, and definitely getting any board right now that leverages on CrossLinx technology is a clever investment. Overclocking, aesthetic and cooling features of the Crosshair IV Extreme motherboard upheld the name of Republic of Gamers branding. Out of the world overclocking results was attained on this motherboard, and I believe that it could be a potential world record holder as well, together with its intricate cooling features that the engineers have put so much thought into it, touched on by the red and black combination for all AMD fans to go crazy, there just isn’t a reason why fanboys won’t go crazy. The motherboard had enthusiasts in mind, and the different features that is carries itself with has shown that it was capable of solving the problems that the enthusiasts of today will meet. Having dual BIOS simplifies overclocking and troubleshooting work while ROG features ensures that this board is one of a kind. I will be giving Crosshair IV Extreme motherboard a score of 9.4/10 excluding the factor of price since there weren’t any details of the SRP of the product. The lost of 0.6 points was due to the exclusion of a better onboard sound chip such as a Creative Supreme FX, or most likely Asus wants us to buy our own preferred audio card. Crosshair IV Extreme Motherboard, ENGTX470, ENGTX465, ENGTX460 TOP, EAH5770 CuCore provided by Asus Singapore. Introduction of Heaven benchmark taken from Unigine’s website. Based on Asus Crosshair IV Extreme Reviewer’s Guide.